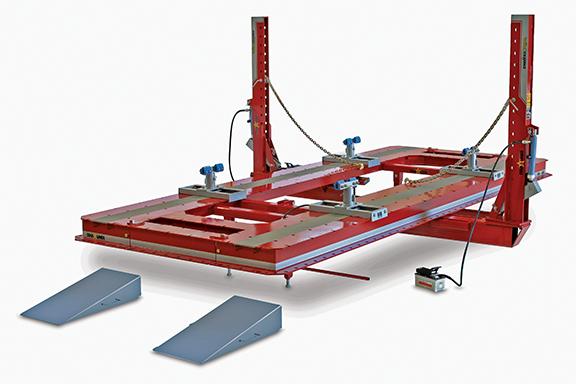 Auto body equipment needs to work fast–for the collision technicians straightening frames and for the customers wanting to know the status of their vehicles. Star-A-Liner’s Cheetah frame machines are some of the fastest and easiest to use auto body equipment in the industry. We like to call them simply fast, and you will, too. Aside from our 5500 series, and SF model, Cheetah frame machines have pulling towers that roll completely around the rack, letting technicians quickly and easily begin the straightening process. The towers have offset casters, so you can set them next to each other for simultaneous multiple pulls. The easy-to-use frame machines let you start and finish the job faster. The SF model has pulling towers that roll 360 degrees without wheels running along the floor. Star-A-Liner has additional auto body equipment that makes technicians’ jobs easier. For instance, our low pull attachment lets you pull from close to the top of the rack bed, while the overhead pull lets you make frame adjustments from a higher angle. The Cheetah body lift is another accessory that makes the job easier and simply faster by letting technicians lift a vehicle to attach pinchweld clamps. By making our equipment less complicated, it’s easier to use, easier to master and lets you get the job done ahead of time. Star-A-Liner’s Cheetah frame racks are proudly made in America. Star-A-Liner first introduced the simply fast Cheetah line in the 1980s and has been a few steps ahead of the industry ever since–always fast, and easier to use than ever.